Professionals responding to individuals who are experiencing a crisis are often challenged by the unpredictable moods; escalating, high-risk behaviors; and deep despair presented by their clients. Without a good framework for understanding crisis dynamics, and an understanding of the essential elements of effective crisis management, serious symptoms might be left unaddressed, exacerbating the crisis. This results in an extremely stressful and high-risk situation for both the client and the professional. This course provides key training for licensed behavioral health professionals on how to recognize when a person is in crisis. 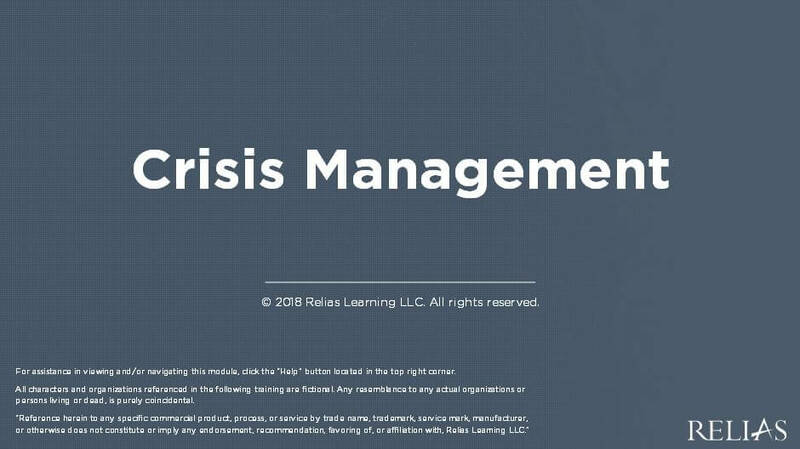 You will learn how to effectively help people return to their pre-crisis level of functioning through the use of a task-based model of crisis management. Specific interventions will be described that you can use to stabilize clients who may be impacted by an isolated crisis, as well as those challenged with multiple crises. You will learn how to create a crisis prevention plan, along with how to use it with clients in a variety of settings. Further, you will explore how to handle situations with individuals who experience recurring crises, those who are hostile and aggressive, and people with substance use disorders. Note: While assessing for safety risks is one component of crisis management addressed in this course, it is beyond the scope of the course to provide comprehensive training on how to manage suicidal or homicidal emergencies. Clinicians are advised to seek additional training in these areas. This course also assumes the learner has a clinical background and foundational knowledge relevant to the content as it is targeted to licensed clinicians. Define what constitutes a crisis and explain how to recognize when a person is in crisis. Explain the major elements of effective crisis management. Apply crisis management techniques to help a person return to their pre-crisis level of functioning. Explain the process of developing crisis management plans and what details these plans should include. List ways that approaches for managing crises may be adapted with special populations, including those who experience frequent crises or who have a substance use disorder. How Does a Crisis Develop? When Is a Crisis an Emergency? What Are the Goals of Crisis Intervention? Kathryn Falbo-Woodson, MSW, LCSWA, is a systemic therapist with 17 years of professional experience, including 11 years in leadership. Her background includes training, community and resource development, advocacy, case management, and psychotherapy. She is a Master Trainer for QPR (Question, Persuade, Refer) and a former certified instructor for Mental Health First Aid. Kathryn is certified to train audiences in Talk Saves Lives and More Than Sad, and provides instruction about suicide risk during Crisis Intervention Team training (CIT) to law enforcement audiences. She has led and participated in various mental health and suicide prevention initiatives, including the development of the NC Mental Health First Aid program and the creation of the first-ever online suicide prevention curriculum for NC's Department of Public Instruction. Kathryn serves as president of the board of directors with the NC Chapter of the American Foundation for Suicide Prevention, co-chairing the public policy committee, and leading local efforts to raise awareness and funding for suicide prevention through the Charlotte Out of the Darkness Walk (NC's largest event dedicated to saving lives and bringing hope to those affected by suicide). She serves on a leadership team implementing Zero Suicide for Carolinas HealthCare System in Charlotte, NC, the largest healthcare system in the Southeast. She works as a clinical social worker and psychotherapist at Levine Cancer Institute, the world's only outpatient cancer center with Planetree designation. Disclosure: Kathryn Falbo-Woodson, MSW, LCSWA has declared that no conflict of interest, Relevant Financial Relationship or Relevant Non-Financial Relationship exists. The target audience for this course is: entry level Case Managers; entry level Psychologists; intermediate level Alcohol and Drug Counselors; intermediate level Marriage and Family Therapists; intermediate level Nurses; intermediate level Professional Counselors; intermediate level Social Workers; in the following settings: Health and Human Services.